Retail Price: $229.95 ONLY: $209.95! 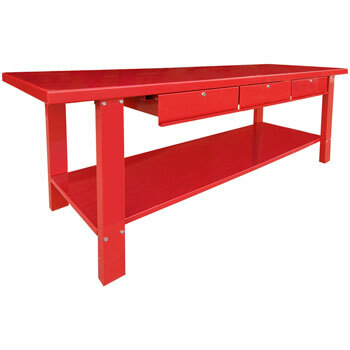 The TCWBS3 is a heavy duty, all steel construction workbench designed for general shop use. large surface area makes it an excelent work area for any kind of shop or garage environment. 3 heavy duty steel drawers also provide convenient storage space. The table has a 79” x 25” steel top, and the table’s height is 34 inches. The TCWBS3 weight is just under 210 LBS. EACH. If you have any questions or would like more information on this equipment, PLEASE CALL US AT 1-888-736-5094! Due to the size of this equipment, customers may need a Forklift, wrecker boom or similar piece of equipment to unload their product from the truck. This package is under 200 LBS, so 2-4 people should be able to unload it by hand if they are careful. If you are unsure about unloading this equipment from the truck, do not have the space available for a semi tractor w/ a 53 ft trailer, or do not have the necessary equipment for unloading the product(s) from the truck, we STRONGLY recommend having the equipment delivered to a business address* with a dock that is equipped to unload large trucks. *For customers unable to accommodate a large truck at their residential address and have no business address available, again, we STRONGLY urge them to have their product shipped to a local trucking terminal. The terminal staff will be able to unload the equipment from the truck and onto a truck or flatbed trailer for you at no additional cost, and then you will be able to unload the equipment with no time constraints.